Wolfenstein 3d for the GBA proves that game developers don\'t mind porting a 10 year old game for a new generation of gamers. Though this does sound like a good idea, this game on the GBA is bound to be harassed by a new generation of games that want better graphics and voice-overs in their games. Wolfenstein 3d is also on the PC, SNES, and PSone. This game is ten years old, enough said. But for those who don\'t understand how much a difference of ten years makes on games, check out these graphics. I enjoy them though, merely for nostalgia purposes. I give the graphics a C.
Same as above, ten years old and it show it age. All the guns make the same ping noise, all the Nazis scream the same way, and all the doors make the same annoying noise. I wish BAM entertainment enhanced this department. I give it a D.
The only part of the game that hasn\'t aged terribly, the controls feel natural on the GBA. 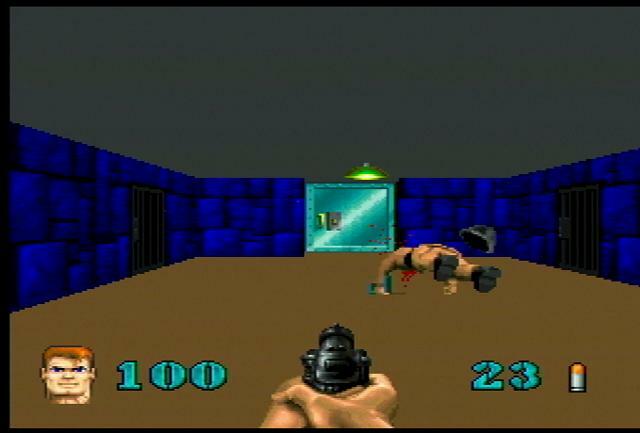 The game play tactical, as running into a room with two Nazis always results in a gunfight with you on the losing side. I give it a B+. The story is simple. You are an American solider in world war II who gets captured by the Germans and imprisoned at a castle named Wolfenstein. Now the rest of the plot is you gunning things down. I give it a B, because it?s simple and never gets in the way. This is a Mature rated Gameboy game, chuckle to yourself. The GBA has few to none M rated titles, making this game seem much more inappropriate compared to the other titles in the library. Blood sprayes when a nazi is hit and they scream. Swastikas and pictures of Adolf Hitler are randomly posted in the castle. I give it a C-. I like this game because it brought me back to my roots. It has aged, and that will turn off a few, but I give it thumbs up. Overall I give Wolfenstein 3d a B.